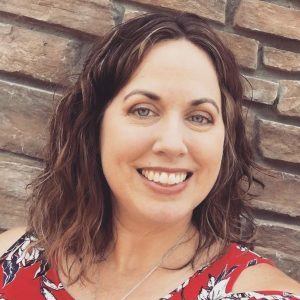 Quite a difference from two weeks ago, when I wrote my last daybook post! It is cold and cloudy, and it doesn’t feel like spring. My children are disappointed in this weather, because this week is spring break for them. * A sure sign of God’s love for me … even when I started the day on the completely wrong foot. Yes, that is a whipped-cream heart in my coffee that I didn’t even try to make! I know it was from God, reminding me of His love and mercy. 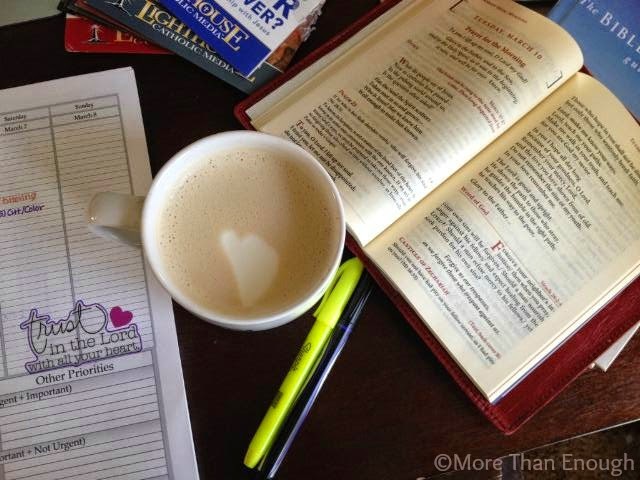 He definitely knows how to speak to me—through my coffee, of course! * Watching my daughters work hard on their swimming and enjoy the opportunity to compete in their first swim meet. * Spring break … Even if we’re staying home and it’s cold, it’s nice to have a break! * A new four-month health and fitness class I am taking. I have been using this prayer book almost everyday for five years. It’s from my Spiritual Exercises retreat. But just last weekend was the first time I ever read the following prayer. And it was just what I needed. Lord, behold a soul that is in the world so that Thou may exercise Thine admirable mercy to make it shine before heaven and earth. In vain Thine enemy—who is also mine—sets new snares for me daily. He may cause me to cast away everything except the hope I have in Thy mercy. Even though I fall a hundred times, and my sins were a hundred times more horrible than what they are, I will always continue to hop in Thee. * Momnipotent by Danielle Bean. I am reading this book and accompanying study with five wonderful women. We only have one session left. The message has been just perfect for where I am in my motherhood. It has been much more thought-provoking and self-reflective than I expected. I have loved it. * The Thief by Stephanie Landsem. This is the second book in her Biblical fiction series, and it is just perfect for these final weeks of Lent! 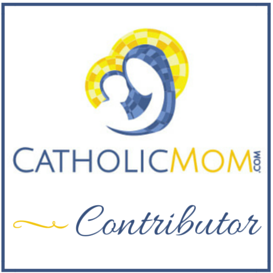 I recently interviewed Stephanie for an article on CatholicMom.com, and I am currently hosting a giveaway for her newest release, The Tomb. It is not to late to enter! I will be announcing the winner Wednesday, on the Solemnity of the Annunciation! I have a few Paleo meals on the menu from eMeals. I also got the Paleo cookbook, Well Fed 2, for my birthday, and I plan to make Sunrise Scramble and Cincinnati Chili this week! 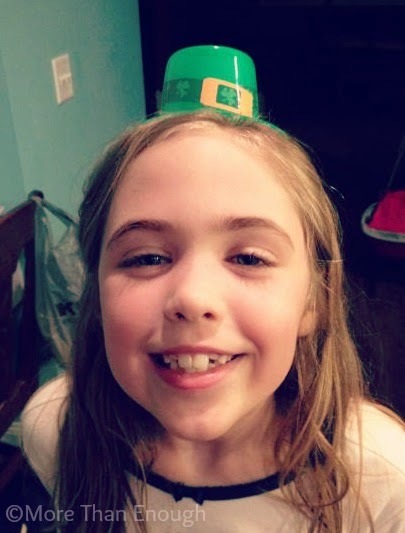 My sweet little St. Patrick’s Day girl, and we’re not even Irish! * Easter dress/outfit shopping—What do we have? What do we need to get? This will also serve as attire for our upcoming parish directory photo! I am terribly distracted by the glimpse of your planner. Being a planner geek, I have to ask about it! So–where did you find it? What do you love about it? For those of us who like to use planners, we should bring all the parts we like of the planners we use, and make one AWESOME planner! Thank you! That planner has a LOT in there. (Oh, grammatical errors in my planner would be a deal-breaker for sure.) 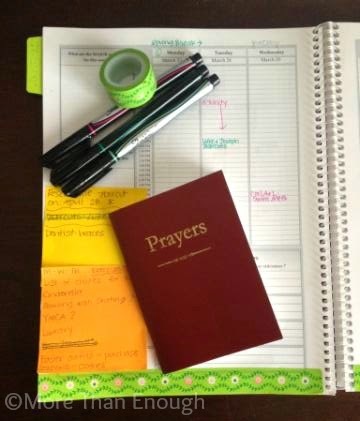 I use the Catholic Daily Planner by Michele Quigley, and I really just wish it had time slots in it. That's my family planner. But without time slots it can get a little messy in there. For work I just use a 7×9 notebook, 2 pages per week. I love planners!!! Like Barb I geek out when I see someone display theirs!! You are in good company, Aleigh! See above for what planner I am using and what I like/don't like about it! Thanks for stopping by! Yes, Jenny! Washi tape is so fun and pretty! My oldest girl is getting into using it on her letters, so it is fun to enjoy something together! Yes! You should look into a nice silent retreat for yourself. I am sure you would love the one I go to … Not sure if they come to your corner of the country, though, but I am sure you could find one that suits you! Good for you – you are in a groove with spiritual and physical health! As for me, I didn't send in my form in time for the retreat. Maybe next year? How about the June one, Tracy?? I will email you the registration form! I am about to attend my 4th Miles Christi retreat! Oh! That is wonderful, SZM! I will pray for you, that you may have a fruitful Spiritual Exercises! Thanks for stopping by and saying hi! I have to tell you that there is no way to make Cincinnati Chili paleo — it must, must, must have spaghetti and cheese. PS since you are able to read my messages here I'll tell you I sent two emails asking if you want the same size bracelet you had before. If you responded I never got it. Ha!! Of course someone from Ohio would know the right way to enjoy Cincinnati Chili! This one serves it on Zucchini Noodles. Does that count for spaghetti? Weird about our emails, Barbara! Why has that been such an issue for us? I did not get the email about the bracelet. Just the one about the different way you are making them … I think the same size should be fine! But again, no hurry! I know how busy you are with all those dresses!